The KioPro is the ultimate sales presentation tool. This slick, stylish coffee table creates the perfect platform to deliver stunning sales presentations or visual pitches. Watch this video to see how impressive your sales presentations could be. 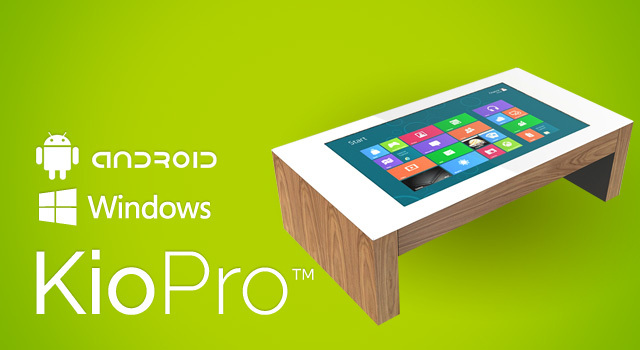 The KioPro table supports two, ten or twenty simultaneous users with Microsoft Windows 8 multi touch technology. An Android multi-touch version is also available. The number of touch points required is recommended based on the size of touchscreen chosen. Our standard sizes at coffee table height include 32″, 42″, 46″, 55″ & 65″ or we can create bespoke tables to suit your needs. 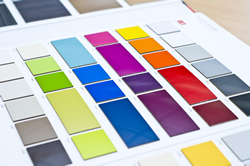 What surprises most clients is the way that our touchscreens work through glass. Our special through-glass touch technology ensures that your touch screen display and PC hardware are safely housed, protected and secured within a stylish design. Unlike other interactive touch tables on the market, there are no recessed touch screens or bezels in the tabletop. The KioPro features a beautiful edge-to-edge toughened glass surface with chamfered edges, which also allows drinks and food to be placed safely on top during use. * You never directly touch the screen display, this method is used in competitor products but can easily lead to screen scratches, damage, liquid ingress etc. Watch this video to understand more. 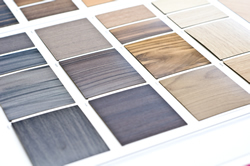 We are the only company in the world to create interactive touchscreen tables with bespoke furniture finishes, including wood laminates and Formica colour ranges. The KioPro™ can be made in different heights for usability, incl standing, desk seating and low level, such as coffee table height. For example, you may have existing low level seating in your reception area and would prefer these interactive tables to match the wood finish on your existing seating and to be built to the correct height for usability. We can ensure that your new interactive furniture beautifully integrates with your current decor. With our stylish multi-touch tables, you can make a memorable, lasting impression on your customers. You will never look at an ordinary coffee table with printed brochures and leaflets in the same way again! Get the competitive edge by calling today on 0161 768 0008. * Most sizes are available within 3-4 weeks lead time. * Multi touch software app is sold separately.